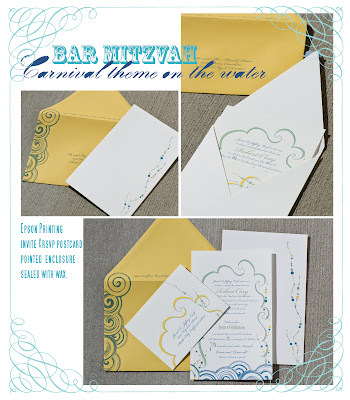 So this Bar Mitzvah was in October but I finally took some pictures of the finished invite. I actually helped plan and decorate the entire party. Besides the invite I made custom decoupage lazy susans for each table (17 of them) some were 2 story susans that were 36" in diameter, others were small 18" round. I also did arrangements the day of for the tops of the susans with carnival masks and beads. The table linens I chose reflected the colors from the invites Blue, sage and gold. Go to my website under gallery- details- bar mitzvaah http://flushdesigns.com/BarMitzvah.html you can see some pics. Unfortunately it litterally took me 6 hours to set everything up I got only night shots, and a few at that.